I first visited Tirupati when I was about 10 or 11 years old. My mom had taken a vow to walk up the hills to reach the temple, something which everyone thought at the time, extremely foolhardy. My mom refused to budge, and accordingly, the trip was made, with a whole horde of relatives accompanying us. While it was, to most of them, an important pilgrimage, to me and a cousin (a year or two younger), it was an adventure, something we enjoyed thoroughly. Even today, it is this first journey up the hill which remains one of my happiest memories – my very first experience of travel. There is much to write about that journey, but maybe some other time…. Meanwhile, here’s an account of a journey we made just last month to the temple amidst the seven hills, which, to me, in spite of the huge crowd (which the temple has now become famous for…), remains a place of special importance. My mom and aunt had been planning a trip to Tirupati to perform certain sevas (religious rituals), for almost a year. At the beginning of this year, they finalised the dates and asked me to join. I wasn’t sure if I would be able to join them, since the dates clashed with my summer plans. By the time I decided to join them, tickets weren’t available. I only managed to get a return ticket to Bombay, but didn’t have tickets to go to Tirupati. I, however, have a firm faith in the lord, and decided that if he wanted me to come, he would provide me with the means to reach his abode, and set out for my holidays. As it turned out, we weren’t able to leave on the decided dates, and had to postpone our trip by a few days. Then we found that tickets were available for Tiruppur on the dates we wanted, and I decided to spend a few days with my sister-in-law there. Eventually, we decided to go to Puttaparthi and have darshan of Sri Sathya Sai Baba, and then head to Tirupati from there. There are frequent buses from Puttaparthi to Tirupati, about eight buses a day. There are also a variety of buses, ranging from the usual ones to the so-called ‘Super Luxury’ buses. All the buses take around 8 to 9 hours to reach Tirupati, and most of them are day ones. There are only a couple which run at night, and these are the more expensive ones – the super luxury buses. Samhith was expecting a Volvo, but I told him to keep his expectations low, as they certainly wouldn’t be as comfortable as Volvos, and it was a good thing I restrained his expectations (and mine), for the bus turned out to be anything but luxury – forget ‘super luxury’!!!! The nomenclature apparently only meant that the normal seats had been replaced by push-back ones, and only reserved passengers were to be taken on board. Reality: the seats were bad, dirty, and uncomfortable…… and yes, even the unreserved managed to buy tickets in black and get on! Advice: Don’t ever get on to the bus unless you just HAVE to! Try out the day buses (except in summer, of course). They are apparently not so bad, since there are fewer pretensions….. Anyway, we reached Tirupati at day break and headed to the hotel where my mom, my aunt and her brother’s family had already checked in. quickly freshening up, we were ready for the hectic day that lay ahead of us. There are a number of temples in and around Tirupati, which are all very interesting and beautiful. I have visited many of them at different times, and shall, sometime, write about them all. At the moment, I am restricting myself to those temples we visited on this trip. Sorry guys, very few photographs, as I was made to leave my camera in the car before entering the temple complex. Home of the lord’s consort, Padmavati, it is a custom to visit this temple after having darshan of Lord Venkateswara. However, time, and our schedule being what it is like these days, we often bend the traditions to suit ourselves, and we chose to visit the goddess before going on to meet her husband. The temple is a huge and beautiful one, and over the years I have noticed less and less of it as the temple has become more and more crowded! This time, the crowd was surely the largest I have ever seen. After all, summer holidays are when people from remote corners of India come to pay their respects and mark their attendance for the year! The main deity is Padmavati – the consort of Lord Venkateswara. According to mythology, she is Vedavati, a pious lady who performed austerities to win the hand of Lord Vishnu. When Ravana tried to molest her, she cursed him that his downfall would be brought about by her. According to one version of the Ramayana, it is Vedavati who takes the place of Sita when Ravana kidnaps her, while Sita remains in the care of Agni’s wife. After the war, when Ravana is killed, Agni returns both Sita and Vedavati to Rama after the Agnipariksha episode, and asks him to accept both of them as his wives. Rama, who has taken a vow of monogamy, refuses, but promises Vedavati to marry her in the kaliyuga. It is believed that Vedavati re-incarnated as Padmavati, and got to marry the lord during his decent on earth as Lord Venkateswara. She remains in her hometown at Tiruchanur, while her Lord takes his abode on the seven hills, blessing the people who visit Him, and with their offerings, repaying the huge loan He took from Kubera, the lord of wealth, for His marriage. It is for this reason that a trip to Tirupati is incomplete without a visit to Tiruchanur, just 5 Kms away from Tirupati. There are a couple of other smaller shrines in the temple – Balarama Swamy Krishna – no, not Balarama, but only Krishna – the lord of Balarama – and Sundara Raja Perumal. During recent visits, only the main shrine used to be packed to capacity, but this time, we met a crowd at each and every shrine, and had to wait in a long queue every time. The special darshan ticket helped us bypass the queue to some extent, but we had to join the normal queue in the end. What certainly works better is the usual incentive – holding out money to one of the numerous temple employees – it works like a charm! Most of the temples in and around Tirupati are, by default, related to the many legends about lord Venkateswara. This temple is also one of them, though the temple owes its origin to Sage Agasthya, who had his hermitage at this place long before the lord arrived here. The lord apparently arrived here after his marriage, and stayed at the ashram for 6 months. It is a popular belief that one does not climb a mountain just after marriage, and the lord couldn’t return to his home on the summit, so he chose to spend his time in this ashram. The temple here, as the name suggests, is dedicated to lord Shiva as Agasteeswarar, the lord of Agasthya. The temple is a beautiful one, situated on the banks of the Swarnamukhi River. It must be really picturesque in the monsoons, but was completely dry since the summer was at its peak. The temple has the main sanctum dedicated to Shiva, with a smaller sanctum on the right for the Devi. On the outer prakaram are many smaller sanctums, dedicated to the navagrahas, Kamakshi and other forms of the Devi. There is a small mandapam in the middle of the river which houses an interesting thing – there is a sort of footprint (if you can call it that), believed to be that of Lord Vishnu. Incidentally, this temple is the Kula deivam (family deity) of my aunt, and she says that the footprint looked quite natural when she used to come here as a child. Now, with all the attention drawn towards temples with the many magazines (and bloggers like me….) writing about temples and encouraging people to visit them, it has undergone some renovation, and has been well covered with concrete at the edges, making it look man-made. There is a small figurine of the lord inside this, which looks more authentic! There is also a statue with the front showing Lord Shiva and Lord Vishnu at the back. There was a lone priest sitting there, and he tried to convince us that the statue dated back to the days when the lord roamed around these places, but we weren’t buying that!!!! Recently, a few other statues of Ayyappan and some other deities have also been installed there….. It probably helps the priest to get a few more rupees every day!!!!! 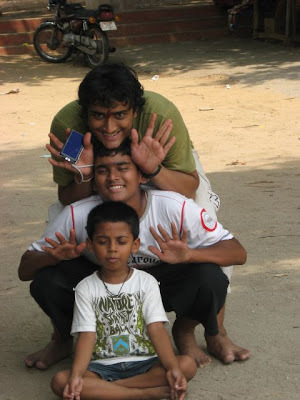 Meanwhile, here is Samhith with my cousins – all of them having a blast!!! This is a huge temple, probably the biggest in the area, and has many sub-sanctums apart from the main one. I have never yet been all over the temple due to lack of time, but this time, we at least managed to see the main deities. Hopefully, someday I shall be able to visit the temple at leisure….. It is worth it!! The main sanctum has Govindaraja Swamy in sleeping posture with Lord Brahma on the lotus coming out of the navel, Sridevi and Bhudevi at His feet. An interesting addition to this scene is the presence of Madhu and Kaitabha, the twin asuras who came out of the ear-wax of the lord and attempted to eat up Lord Brahma. The next sanctum is that of Parthasarathy – Krishna, when he acted as the charioteer of Arjuna (Partha). Here, he is in sitting posture with his consorts Rukmini and Satyabhama on either side. The next sanctum has Kalyana Venkatramana Swamy – in standing posture, looking almost exactly like the Venkateswara Swamy in the main temple. Thus, this temple has an interesting array of deities – Lord Vishnu in 3 postures – sleeping, sitting and standing – all in one temple, and within the same prakaram. 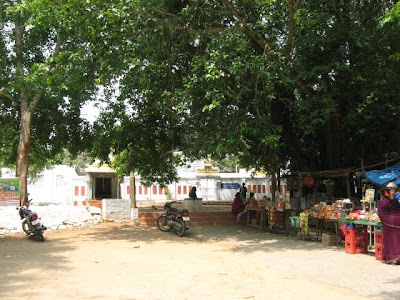 There are few other temples with a similar situation – to my knowledge, the temple at Tiruneer Malai at Pallavaram near Chennai has the lord in all 3 postures, but at different levels, and the temple at Thiruvallikeni(Triplicane) in Chennai has the lord in these postures in different prakarams. This however seems to be the only temple with the lord in the 3 postures within the same prakaram. If any of you have any more information about similar temples, I would love to here from you. Please send me a mail here. The only sanctum dedicated to a goddess in the main prakaram is that of Andal, the foremost devotee of the lord. In the outer prakaram are the other sanctums – the first being that of Pundareeka Valli Thayar – the wife of Govindaraja Perumal, followed by that of Sri Ramanujar. The other deities are Koorathalwar and Chakrathalwar, as well as other devotees of the lord. The temple is huge, and it is quite a distance from the main entrance to the temple. Along the route from the gopuram to the temple, the pillared hall is filled with shops selling puja articles and articles made of wood. Walking along this hall, one can see beautiful wooden dolls, utensils and toys, all of them beckoning you to buy them and carry them home with you. This is a better place to buy wooden things, even better than the stalls outside the main temple on the hill. You not only get a variety of articles, even the price is lesser here. In our family, during navaratri, we keep wooden dolls in the golu, called marapachi, which are traditionally brought here. Go on, start your own collection…. And look out for a blog on mine later on….. Meanwhile, for those of you who are unaware of the legends connected to Tirupati, and have trouble following the many stories mentioned here, look out for a post on the legends themselves. Samhith has been asking why I am not writing about the story of the temple, and I think it is a good idea to write it down. As I was reading this post, a thought crossed my mind...I don't remember seeing a Tirupati post on your blog earlier which is very surprising given the fact that temples being your cup of tea, Tirupathi should have featured atleast a couple of times before. I used to hate going to Tirupati as a kid (still do). The ghat road, the rush, the dirt ...nothing about that trip was spiritual. That still didn't stop me from enjoying your post.